I can hardly believe that the organizers were brave enough to give this conference the title “Patriarchy.” Take that, you foes of fatherhood! Doesn’t it give you a thrill? But this isn’t going to be a chest-thumping festival. Naturally, distortions of manhood and fatherhood will be discussed too. Shame is not the same as guilt – or perhaps it would be better to say that there are several kinds of shame. To hide one’s sins from others really is the shame of guilt. But to practice modesty is the shame of innocence. Even as to the shame of guilt, a distinction must be made. One might conceal his sins to escape the punishment he deserves. But he might also conceal them to spare others exposure to his taint. I wouldn’t condemn a man for that. I am a Chinese scholar. It is said that Thomas Aquinas gave up his research on rational theology before his death and confessed his research is nonsense and it means he retrogressed to Tertullian standpoint (embracing credo quia absurdum). Is this true? Good question. The view of Thomas Aquinas which you mention is quite common, but profoundly misleading. Later, at the end of his life, he is said to have experienced another vision. 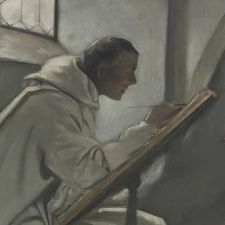 Afterward, he told one of his brothers in the Dominican order that he could no longer continue to write, because in comparison with what had been revealed to him, all that he had written seemed like straw. This is the statement which gives rise to the misunderstanding about which you ask. But it is very important to remember that St. Thomas never repudiated what he had written before. Though his past writing seemed to him “like” straw in comparison with the vision, it was very good so far as it could go. Straw itself is good. The Bread of Heaven is better. This should not surprise us. Throughout his life, St. Thomas had always argued that what can be known about God by reasoning is excellent, but it is only about God. The vision of God in Himself, granted to the souls of the redeemed in the next life, is infinitely superior. Now that he was standing at the very door to that life, it was difficult for him to give his attention to anything less. Then Are All Good Men Good Statesmen? I read your argument that a bad man cannot be a good statesman – a theme I always enjoy bringing up when I teach. There are interesting dilemmas, however. I was not old enough to vote in 1972, but even knowing then what I know now, I do not believe a vote for McGovern could be justified -- which leaves me with Nixon. But I see no other choice. Your view? I take your point about voting for President Nixon instead of Senator McGovern even though Nixon was a scoundrel, but I don’t see the dilemma the same way you do. I am only saying that a bad man cannot be a good statesman. I am not saying that a good man is inevitably a good statesman. The remark I’ve just made uses the term “good man” in your sense of the term. By a good man, I think you mean someone who has all of the moral virtues, even though he may lack prudence. Senator McGovern certainly lacked prudence, and he would have made a terrible president. But there is another, older way to take the meaning of the term “good man.” For in the classical view, prudence is one of the moral virtues. In fact, it is their intellectual pivot, because it is nothing more than the wisdom to know how to pursue the ends which the other virtues make us desire. In this sense, a completely virtuous man is not one who possesses justice, fortitude, and temperance, even though he may lack prudence. He is one who possesses justice, fortitude, temperance, and prudence. Then would a good man in that sense inevitably be a good statesman? The answer is still “No.” Someone might be prudent in the everyday things with which we all have to deal, but not prudent in the larger matters which concern the body politic. If he has all the other moral virtues, and moreover he has not just everyday prudence but also political prudence, then I would say yes, he has what it takes to be a good statesman – but not every ordinary good man does. Far from it. There have been many times in the past two years that I have wished that I could chat with you about the connection between moral character and political greatness – a connection you raised explicitly way back in the Clinton years. Some day, perhaps. I would enjoy chatting too. Thanks for your letter, and for calling my attention to Walter Williams’ essay. Mr. Williams argues that although the current president “does not have the personal character that we would want our children to imitate,” he “has turned out to be a good president, save his grossly misguided international trade policies.” Some of the actions for which Williams praises the president are making good nominations to the U.S. Supreme Court, significantly rolling back federal regulations, ending the Obamacare “mandate,” and getting the United States out of the fraudulent nuclear deal with Iran. Of course Williams recognizes that Left will view the same actions as “horrible, maybe treasonous,” but does not trouble me; I don’t agree with the Left. Regarding some of the other things Williams approves, such as making a sort of progress with Kim Jong Un, I think Williams’ judgment is premature, but certainly the old policy appeasing the tyrant in return for promises no one expected him to keep wasn’t working. So should I change my view that a bad man cannot be a good statesman? No. Trump apologists always overlook the same problems with bad men. Williams’ view of a good president is one who does more good things than bad ones. If that’s what a good president is, then of course a bad man can be a good president. But it’s the wrong criterion. When people like me say a bad man cannot be a good president, that is not what they mean. I have never denied that a bad man can do some good things. In fact I’ve insisted on it. I see no reason to withdraw any of these points. The third is especially important. Trump’s vices drag all of us down, just as Clinton’s did a generation ago. Conceded, the view I am defending is not popular on either side of the political schism. On both the Left and Right, activists think that a thug is all right so long as he is our thug. Couldn’t there be reasons for voting for a bad man? Yes, of course. If both candidates are depraved, but there is good reason to believe that one of them may tend to do better things than the other, then provided that voting for him does not involve formal cooperation with evil, one should vote for him. In that sense, sure, we will have to see how things work out with Mr. Trump. But no one should deceive himself that doing the things that we want him to do will make him a good president. Does Peggy Noonan Read This Blog? No, we are complaining that the students there don’t meet real life. Real life includes all sorts of people with all sorts of ideas. Academia doesn’t. Is the “meeting real life” excuse merely naïve, or is it offered in bad faith? Maybe a little of both. You can see why some scholars might want to believe that they represent “real life.” If they were ever to admit to themselves how they shut out the views they dislike, it would eat away at their picture of themselves as critics of the “narratives of power” and protectors of society’s underdogs (of whom, by the way, most have little first-hand knowledge and even less respect). On the other hand, it seems likely that many university people really don’t know how narrow their intellectual culture is. Since the only people they ever meet are just like them, they think they represent the Great Center, and that their little end of the spectrum is the whole universe of reasonable discourse. By the way, they censor themselves just as ruthlessly as they do others. If a scholar of this sort ever catches himself implying that there might be something questionable about some behavior that PC norms hold sacrosanct – yes, it happens – he hastens to cover himself by saying, “Not that there’s anything wrong with that.” And he tries to believe that this is true. Not only does his social place depend on covering himself, but so does his sense of himself as someone who belongs. Let’s think about it. If it is true that nothing matters, then what difference does it make whether we live ironically, heroically, or in despair? Forgive me for being obvious, but if it does make a difference, then something does matter. Our task, should we choose to remain men – and we always have the option of declining -- is to find out what.